The support of government agencies will be obtained to fight the countervailing duty petition filed in the USA by Titan International on a class of tyres exported from Sri Lanka to the USA, State Minister of International Trade, Sujeewa Senasinghe told leading rubber exporters at a meeting at the EDB recently. Representatives of domestic and BOI firms such as DSI, Global Rubber Industries (GRI), Lalanka, Herotec GMBH, and Loadstar were also present. Quincy, Illinois based Titan International Inc (joined by United Steel, Paper, and Forestry, Rubber, Manufacturing, Energy, Allied Industrial and Service Workers International Union, ALF-CIO-USW), filed a countervailing duty petition on pneumatic off-the-road tyres from India, China and Sri Lanka with the Department of Commerce and International Trade Commission of the USA on January 8. It stated that "imports from China and India are being dumped in the US market, and imports from all three countries are benefitting from government subsidies, and the imports are causing material injury to the domestic industry producing OTR tires." CEO and Chairman, Titan International Inc., Maurice Taylor said, "In 2007 Titan won anti-dumping and countervailing duties on OTR tyres from China, but over the past few years there have been a number of companies putting wheels into the tyres to get around the duties." "This has become a big problem because some overseas operators have actually advertised on their websites on how to beat duty. Our petitions address tyres from China which enter mounted on a wheel or rim," he said. "We have also added India and Sri Lanka to this new action. We believe we have strong cases and look forward to the US government conducting investigations. We urge our government to move expeditiously to investigate the unfair trade practices alleged," Taylor said. Executive Director, GRI, Ananda Caldera (representing the Sri Lanka Association of Manufacturers and Exporters of Rubber Products -SLAMERP), said, "Rubber is Sri Lanka's third largest export. This filing in the US affects one of our key markets and we call on the government to support us. The demand for our rubber products is growing globally due to its quality. Sri Lanka is a leading supplier in the global solid tyre market." "We are now compelled to import rubber as domestic rubber production and supply cannot meet the demand we have. Domestic rubber production that was 120,000 MT a few years ago has now drastically fallen to 80,000 MT and this volume is insufficient for us to sustain exports, which is steadily increasing," he said. 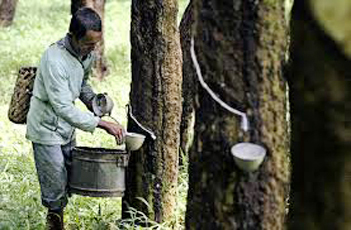 "We are unable to compete with rubber exporting countries such as Thailand, Indonesia and Malaysia when exporting to China, the largest consumer of natural rubber, due to the 15% rubber export tariff," Caldera said. "Therefore, we call on the government to take steps to remove this export tax in consultation with other government agencies such as the Treasury and the Central Bank and to expedite the Sri Lanka-China FTA which can help our rubber exports greatly," he said. While several leading exporters from Sri Lanka use imported items in their export production, rubber exports are somewhat different - their value addition is over 70% as a result of using rubber harvested within the country. As such the rubber sector is considered a wealth creator by many, and some even consider that rubber exports have the potential to surpass the country's leading export merchandise, apparel, Caldera said. During the past decade, the industry had an annual growth of 10% on average. In 2014, exports of various kinds of rubber products from Sri Lanka totalled over $1.7 bn. "One of EDB's main roles is to guard you in emergencies such as this and cater to your well-being as you are committed rubber exporters, and serve the country," said State Minister Semasinghe. "Since this filing is not only against Sri Lanka but against India and China as well, it is a cross national exercise and I will enlist the support of relevant government agencies such as the Treasury and the Central Bank and our Embassies in this regard. Government support for the rubber sector would continue," he said. Sri Lanka holds about 40% of the $2 bn global solid tyre market.